Hershey somehow ended up in the local shelter. He appears to have been well taken care of, so possibly his owner passed away and there was no one to take him in. A sad story that happens often. Luckily, I was able to get him out of the shelter. I have no way of knowing what his name has been throughout his life so I named him Hershey. His nose is brown unlike most doxies who have a black nose. A brown nose usually indicates there is chocolate in his genes. 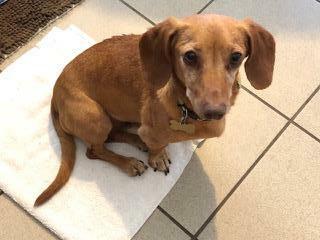 Hershey is a pretty red with lighter colored eyes and the brown nose. Hershey is very sweet, affectionate, and friendly. He has proven to be a very easy foster. He goes outside to potty but does not like being left outside alone and wants to come back in where the people are. He sleeps all night in a small doggie bed which he prefers over a larger bed. He knows how to use the doggie door. He spends lots of the day sleeping. I’m not sure if that’s because of the time he spent in the shelter and in boarding where he probably couldn’t get a very relaxing sleep. He’s making up for it now. 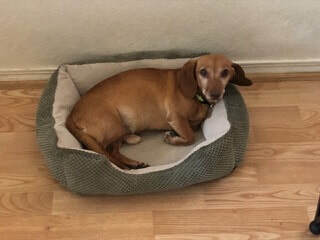 Hershey gets along with other doxies but has not been tested with cats. He’s a bit camera shy which hasn’t allowed me to get any really good pictures of him. Hershey is a true love and will make anyone a great companion. He’s a good traveler in the car and enjoys going for walks. Hershey just had a dental although his teeth weren’t bad for his age which makes me think he was well cared for up until recently. Hershey is up to date on shots, neutered and micro chipped. For more information on Hershey, feel free to e-mail me at doxykeeper@me.com or call 661 943-4888. An approved application is required for Hershey’s adoption. The tax deductible adoption donation for Hershey is $175.